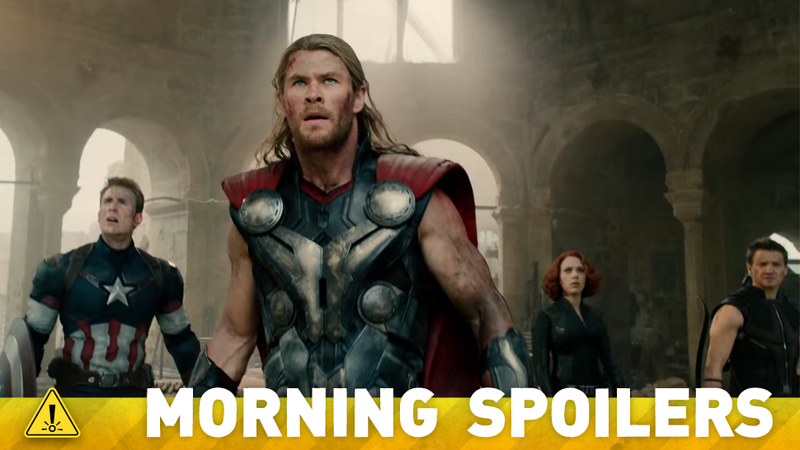 What Surprise Marvel Characters Will Show Up In Avengers: Age Of Ultron? Gal Gadot talks about Wonder Woman in Dawn of Justice, while The Rock talks Black Adam and Justice League. The X-Files' return may have taken an important step forward. Plus what's to come on Grimm, Agents of SHIELD, and Orphan Black. Spoilers, ho! Top image: Avengers: Age of Ultron. Speaking to Marvel, Joss Whedon teased that there are even more Marvel characters in the movie than the ones already confirmed. When asked whether some Marvel characters are in the movie that we haven't yet seen in promotional pictures, he answered with a succinct "Yes!" Whedon also explained why Paul Bettany is going to blow everyone away as Vision, and why he really wanted Quicksilver and Scarlet Witch in this film. Between all this you have a career to run. You are on the fast track to be a comic and action start. How important is it for you not to be taken as just an action star? Gal: I will never take for granted the job I have right now. (she actually said 'I will never spit into the well from which I drink from'. It's a phrase in Hebrew that means she won't make fun or look poorly on what she is doing right now. I forgot the equivalent in English ). Playing Wonder Women is a once in a lifetime opportunity. I can't describe to you how much I wanted to play this character without even knowing I wanted to play her. I met a lot of people from the industry in LA for meetings. They always asked me 'what's your dream role? ', and I never could define it. I always answered that I wanted to play a women that is strong and will be a source for women empowerment. I don't want to play a damsel in distress that needs to be saved. I don't like it when women in the movies are shown as the victims. I always thought that if I could send out a message I want to show the strong side of a woman and how she can handle tough situations. He will become an anti-hero, but first, daddy's got to go to work," laughed the actor. He noted that a team-up with the world's greatest superheroes is in the cards moving forward. "I think so, and I think you always want to leave that creatively open – that he could join 'Justice League.' And I think that's the fun part about creating this character right now. Everybody involved from the studio to New Line to Warner Bros. as well to the writer and our producing partners, you definitely want to engage his heroic side, but that has to be earned. With the mythology of Black Adam starting off as a slave...when you start off as a slave, inherently there's things in your DNA that piss you off. That's the bottom line. We have to respect and pay homage to the true mythology, and the heroic side will come down the line. "Afterlife" – As Robert Gonzalez makes his move, Coulson must do whatever it takes to protect the future of S.H.I.E.L.D. Meanwhile Skye's journey to control her powers takes a surprising turn when she meets the enigmatic Inhuman named Lincoln, on "Marvel's Agents of S.H.I.E.L.D." "Search and Destroy" – Reese and Finch scramble to protect a software CEO (Aasif Mandvi) when his behavior becomes increasingly erratic following a hacker attack that reveals all his secrets and unravels his life, on PERSON OF INTEREST, Tuesday, April 7 (10:01-11:00 PM, ET/PT) on the CBS Television Network. The villainous Adalind certainly knows how to push buttons. Will viewers be treated to a confrontation between Nick and her anytime soon? Things get a little weird with Adalind and Nick. She will enter my world, but it's not really a confrontation. It's nuts. The Royal Family have been searching for Adalind's baby, Diana, but Nick obviously had bigger problems to contend with. How will those two worlds collide moving forward? In a huge way. The Royal Family deals me a huge blow at the end of the season that is unforgivable. You'll see. It's celebration time as Diggle (David Ramsey) and Lyla (guest star Audrey Marie Anderson) get married. However, Deadshot (guest star Michael Rowe) interrupts their honeymoon and tells them the Suicide Squad has been given a new mission - rescue United States Senator Joseph Cray (guest star Steven Culp) from a hostage situation in the Republic of Kasnia. Amanda Waller (guest star Cynthia Addai-Robinson) breaks down the mission and introduces them to the newest member of the Suicide Squad, Cupid (guest star Amy Gumenick). Meanwhile, Oliver (Stephen Amell) learns about Ray's new Atom costume and the two have a heated stand-off. Felicity (Emily Bett Rickards) and Ray hit a rough patch. "[The pencil went in deep], but how deep?," Manson says. "That's going to really tell us about Rachel's fate. It is rather delicious to take someone who is that poised and cold and have such a heavy, hard mask and put them in a position where they are less than what they've been before." Comic Book Resources has some set photos from filming on this show — see a few more pictures here. Additional reporting by Abhimanyu Das and Charlie Jane Anders.